= Lower flows. Great for eager first timers and experienced rafters. Class III+ whitewater. = Medium flows. Great for aggressive first timers and experienced rafters. Plenty of Class III & IV whitewater. = Medium-high flows. Great for experienced rafters and a few aggressive first timers. Plenty of Class III & IV+whitewater. = High flows. Challenging Class IV+ whitewater, exciting for experienced rafters. Big waves and swift moving water. = Extreme high flows. Fast moving water, with powerful waves and long rapids. Experience is highly recommended. Trips at these levels are best for very aggressive people who are not afraid of falling into a very fast river with long rapids. The Lower Kern is the Southern California mainstay in the hot summer months. 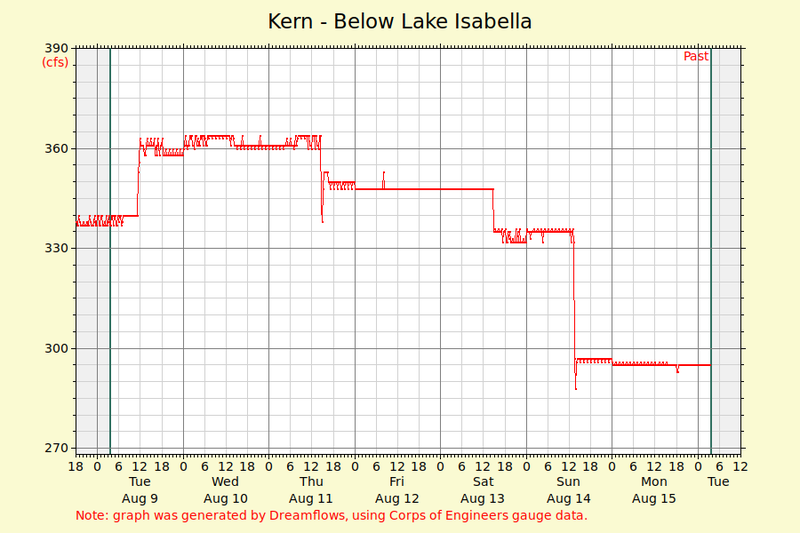 Because it is dam released out of Lake Isabella, the Kern has consistent flows through the end of August, and sometimes into September. If you are looking for a fun way to escape the summer heat, a rafting or kayaking trip on the Lower Kern is the perfect solution. The Lower Kern has dependable summer flows and the water is warmer so a swim isn’t as shockingly cold as other rivers. Below Democrat, the Kern has another set of awesome class IV, V, and V+ whitewater that is a difficult challenge for even the most experienced boater.